AEM Exhaust Systems come in either Cat-Back or Axle-Back configuration. They are designed and engineered to increase performance and power while providing a sporty sound and maintaining OEM standards in fit and finish. Every AEM Exhaust System comes with an Exhaust Noise Statement which serves as a backup in the event a customer is stopped for an exhaust noise violation. AEM's engineers tested several types of exhaust systems for the 2010 and 2011, 2 liter Kia Soul during research and development. As they collected the data and continued development, the axle-back exhaust proved to offer the best combination of performance, sound and style. AEM's 2011 and 2012 Honda CR-Z 1.5 liter aftermarket cat back exhaust systems are designed to enhance the use of performance air intake systems. 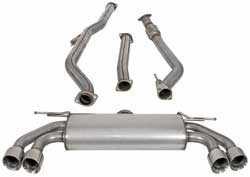 Exhaust system 600-0200 was designed to perform for the life of your 1.5 liter Honda CR-Z. AEM's aftermarket exhaust systems for Hyundai Genesis is a turbo-back exhaust system that was designed for 2010, 2011 and 2012 Hyundai Genesis Coupe models equipped with the turbocharged 2.0 liter four-cylinder engine. AEM's aftermarket exhaust systems for Hyundai Genesis are designed to increase performance and power while providing a sporty sound and maintaining OEM standards in fit and finish. AEM warrants to the original purchaser that the AEM exhaust system is free from defects in workmanship and materials for a period of 1 year. The warranty covers the entire exhaust system. The warranty applies to vehicles NOT used in competitive racing events, if the exhaust system has been altered in any way, installed incorrectly, used with non AEM hardware and gaskets, the vehicle has been in an accident or is not installed on the vehicle for which it is intended to fit. AEM will not warrant any exhaust system that has had any type of coating or heat wrap applied to it. AEM will also not warrant a system that has evidence of being bottomed out on any obstacle or obstruction. For warranty consideration, the original sales receipt must be presented to the retailer from where the system was purchased or any AEM retailer in good standing with AEM. The warranty applies to the parts that are deemed defective by AEM and only those parts shall be replaced. AEM does not assume the cost of removal and reinstallation of the exhaust system. No other warranty expressed or implied (including merchantability) applies to AEM exhaust systems, nor is any person or the manufacturer authorized to assume any other warranty. Further AEM does not assume responsibility for any consequential damages arising from the purchaser’s use of the product. This warranty gives you specific legal rights. Your rights may vary depending on the state where you reside. Horsepower and torque gains are based on specific or similar vehicle dynamometer tests. Results will vary. Legal in most states. Not legal for use on certain vehicles in CA or others states adopting CARB regulations. Please use our part number search to identify the CARB status of a part for your vehicle.